19 Understand this, my dear brothers and sisters: You must all be quick to listen, slow to speak, and slow to get angry. 20 Human anger does not produce the righteousness God desires. 21 So get rid of all the filth and evil in your lives, and humbly accept the word God has planted in your hearts, for it has the power to save your souls. 22 But don’t just listen to God’s word. You must do what it says. Otherwise, you are only fooling yourselves. 23 For if you listen to the word and don’t obey, it is like glancing at your face in a mirror. 24 You see yourself, walk away, and forget what you look like. 25 But if you look carefully into the perfect law that sets you free, and if you do what it says and don’t forget what you heard, then God will bless you for doing it. My prayer for others may not change THEM, but it always changes ME. Forgiving someone won’t change the past, but it will change your future. Serving is not always about my actions. Serving starts with my attitude. When you serve with the right heart, it’s not about you. Don’t reduce fellowship and worship to an electronic device, but make it about God and people! You can be overlooked by being present. You can never be insignificant by being involved. If all your friends are already Christians, you’re not an evangelist. You’re just a cliche’. To say is ok. To do is what’s true. A long, slow drive through Nashville traffic on Thursday found my radio dial attached to the Dan Patrick Show syndicated in Nashville on 104.5 the Zone, when surprisingly I heard the smooth tones of George Strait bumper music. Amarillo by morning, up from San Anton. Everything that I got, is just what I got on. In a split second, I pictured the dashboard of an old, black step-side truck and my dad's beard. I recalled the air freshener hanging on his radio knob and his deep tone - that sounds much like my adult voice, mind you - bellowing into the open window as we drove down the highway and my younger brother perched in the middle of the seat. So without hesitation, I loaded Apple Music to the George Strait channel (and Apple Music or Spotify are great tools worth the money, by the way). 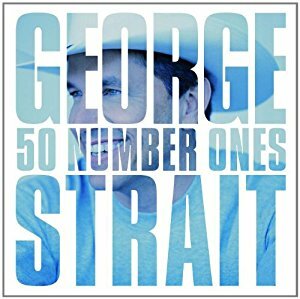 An album featuring 50 number one hits by George Strait was listed, and even though I have been a casual fan of country music, I wouldn't call myself a George Strait disciple. I have never seen him in concert, never bought his album, never worn a shirt or pretended to rock his cowboy hat, though I do have good boots. But as I skimmed through the shuffle button on my steering wheel, something magical happened. I realized I knew every single song. All 50 of them. Well, if you buy that...I got some...Ocean front property in Arizona. I cross my heart, and promise to. It started way back in third grade. I used to sit beside Emmy Lou Hayes. That's why I hang my hat in Tennessee! I could keep going all day. An essentially, I did. Doing so, I learned a valuable lesson this rare, strange Thursday battling the Nashville humidity and interstate and listening to a classic country crooner: music is powerful, and it transforms our mind and soul to places that jar even the longest term memories. You see, as a pastor, all of us realize that music itself is not redeemable. You can apply the same bar tune to a hymn and find chord progressions which work at a dance hall and a worship center. It is the lyrics which connect spiritually to a greater purpose of worship, but that does not diminish the power that a song has on our psyche. Songs drive our emotions and can channel our happiness, loneliness and peace. When we learn to harness the power of music, we transcend time and understand how generations of composers in every genre cast a spell upon our heart with beautiful and haunting tones that plant themselves in the darkest and brightest corners of our mind. My experiences with music are broad. I would say my favorite is a combination of modern rock/pop and then the ever-classic 1980s soft metal and hard rock. You'll find that my playlist makes my mother tap her toe to Southern Gospel, will light up the eyes of a grandfather with a bit of old-fashioned swing, poetically mesmerizes the classical palette with sounds of Bach, Beethoven and marching bands, and makes my kids light up with Christian rock, rap and the pump-up jams of local gymnasiums. But back to George Strait for a minute...his music was so powerful that my friend Djery Baptiste, a sophomore center for Vanderbilt University basketball from Gonaives, Haiti, learned to speak English by listening to his songs. True story. I want to take a moment to share the top influences and memories of music in my life, and see how they compare to yours. As this article is shared on social media, I hope you will find a place where your tranquility met its maker by the jarring melodies to trigger your mind. Hymn - Are You Washed in the Blood - The song was number 177 in the old church hymnal at Halltown General Baptist, where I first took the stage beside my grandfather. My grandmother kept a dummy mic on the top of her China cabinet and placed it in her purse, and while my grandfather was leading singing, I would stand next to him and pretend I was doing it, too. It was this five-year-old Kris that would eventually overcome his stage fright to preach the Gospel on that same stage as a staff member of the church where I grew up some 17 years later. Hymn - I Surrender All - My pastor lost his life on a mission trip. I remember his three girls singing this old hymn at Mt. Pleasant Church before the new building was constructed with my uncle Larry Biggs playing the piano. Pastor Rudy smiled with so much pride listening to his girls sing and every time I hear it, I think of him. Classical - First Suite in Eb by Gustav Holst - A 10-minute, three movement military march that earned our high school band our best rating in concert competition. I had three solos or duets as a trumpet player, most notably a muted duet with Nakya Murray in the second movement as she played her clarinet. As one who easily learned music, I never practiced a piece of music more than this one. Our band played this piece on a trip to St. Louis in which everyone voted to go to Six Flags instead of the Cardinals vs. Expos game. I will never forgive them, though I could still pick up my trumpet and play every single note of the march. Rock - Pour Some Sugar on Me - The power rock anthem by Def Leppard. My mom hated the cover of the Hysteria album. She was convinced it looked Satanic and truthfully, it wasn't but I still have really no idea what it is. Had I grown up to play Major League Baseball, this would without fail be my walk-up song to the plate or entrance song as a pitcher. What I recall, though, was my first intro to the band was when my friend Mike Webb gave me the cassette tape as a Christmas present when he drew my name at church. As a poor kid with little money, no one had ever bought me an album before and I thought I won the lottery. Country - Keeper of the Stars - My uncle Larry played and sang this at my wedding with Jennifer. Tracy Byrd does an amazing job but to this day I still think its the greatest thing my uncle has ever sang. Incredible. When I hear the song, I see my wife looking into my eyes and smiling, every time. Contemporary Christian - I Can Only Imagine - I watched Bart Millard debut this song on television, sitting on a stool with a single spotlight. I believe it might have been the Dove Awards. Nevertheless, I decided once to sing it in church and the sweetest lady I have ever known, Miss Ina Bell, asked me to sing it at her funeral if she ever passed because "she would be dancing with Jesus." She was, and I did. Jazz/Early R&B - Easy Like Sunday Morning - I have to like a band called the Commodores, right? #AnchorDown. This is my favorite song of all time. I played it every single Sunday morning on my way to church when Revolution Church was meeting at H.B. Williams Elementary School. It is my peace and tranquility song. Lionel Richie is so smooth. Classic Rock - Will You Still Love Me? - Chicago was the power ballad king. But this song makes me think of seeing my wife in her wedding dress. You really can't beat that. Heavy Metal - Enter Sandman - Yes, the preacher like Metallica. Get over it. But if I am getting ready to step onto the ball field, I want to run through a wall. This song, Crazy Train and Thunderstruck make me want to run through walls. And Welcome to the Jungle gets an honorable mention here. Pop - Blank Space - You had to know something crazy was coming on the list you did not expect, and yes Taylor Swift made an appearance. But every time I hear this song, I picture my kids singing and dancing and laughing and that makes me smile. Hymn - How Great Thou Art - I played this in front of a concert hall with a piano accompaniment for over 1,000 power and slapped the power C ending like a boss. But nothing compares to playing it in the walls of an old country church with my humble friend, Rita Crafton, on piano, always thinking she was never good enough and never realizing she was always perfect. One of the things I like to do in the vehicle with my kids is sing. Often, I make up lyrics to funny songs, sing off key on purpose, or play classics and introduce my kids to Journey, Frank Sinatra, the Beatles, Guns N Roses, Phil Collins, Reba McEntire and Keith Whitley, to name a few. My son likes TobyMac. My daughter idolizes For King and Country and 21 Pilots. My wife might have an unhealthy crush on Kenny Chesney. I once planned to marry Faith Hill and that story got me in trouble on a church version of the Newlywed Game. But no matter, music is a connector to our psyche. It fosters our development and cultivates our past, present and future with this magical weave of power that cannot be measured or explained. So this Sunday, I fully expect and hope that my words about Jesus from the Bible will be spoken in power and authority, and used by those who come to know him. But God forbid we miss that essential element of worship when the music matches the Word of God, and we can lift those voices of praise to our Heavenly Father. Just like my dad, I hope God likes to sing, too. Maybe he sounds just like George Strait. Come to think of it, there's a song about that. 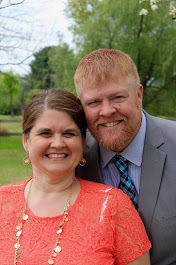 Pastor Kris Freeman serves at Revolution Church in White House, Tennessee, and is the public address announcer for the Vanderbilt Commodores basketball program. Matthew’s PROFESSION is a very critical part of the story. Why were publicans hated by the Jews? - Tax collectors often robbed from the poor, taking extra. Many were crooks! - Two of Jesus disciples were zealots - revolutionaries who wanted to overthrow the Romans. Because tax collectors worked for the Romans, zealots would have hated them - and likely used robbery, violence and assassination to get back at them. - Jesus picked some unexpected people to WORK TOGETHER! If Jesus had called Matthew and Matthew ACCEPTED, why would Jesus go to his party where other tax collectors and friends with a low reputation were gathered? 1. God desires everyone to be a part of his kingdom. Quote this: God is not interested in your resume as much as he is your restoration! Most of the people Matthew knew would have NEVER associated with Jesus! The connection of Jesus to those people was THROUGH Matthew. 2. God grows his kingdom through community. Quote this: You can be overlooked by being present. You can never be insignificant by being involved. Hype would not REACH Matthew’s friends - and it won’t KEEP yours. Jesus was criticized for eating with sinners, but that’s exactly where he SHOULD have been and WANTED to be. Quote this: If all your friends are already Christians, you’re not an evangelist. You’re just a cliche’. Jesus wants to develop YOU so you can reach THEM and He can transform BOTH together! 16 But Jesus said, “That isn’t necessary—you feed them.” 17 “But we have only five loaves of bread and two fish!” they answered. 18 “Bring them here,” he said. 19 Then he told the people to sit down on the grass. Jesus took the five loaves and two fish, looked up toward heaven, and blessed them. Then, breaking the loaves into pieces, he gave the bread to the disciples, who distributed it to the people. 20 They all ate as much as they wanted, and afterward, the disciples picked up twelve baskets of leftovers. 21 About 5,000 men were fed that day, in addition to all the women and children! But how did he come? - Preaching, Healing, Teaching, EATING - so much that they accused him of being in sin while he did it! Because of the poverty level of the people who followed Jesus, HUNGER was a common problem, along with financial hardship, illness and punishment from the ruling Roman government for things like paying taxes and obeying the law. Peter’s brother Andrew, a disciple, brings a young man to Jesus with a potential ANSWER to a definite PROBLEM. Jesus did a miracle. But often, food is the FOUNDATION for a greater opportunity! - Fellowship, worship, prayer, food, hospitality, mentoring, teaching, discipleship, fun! Quote this: Don’t reduce fellowship and worship to an electronic device, but make it about God and people! You likely spend more time on social media in a DAY than you will intimately with people in a whole WEEK! We can do better if we want better! What’s the secret to a growing body of believers that make up a church? Jesus knew that FILLING THEIR BELLIES would not bring them salvation. But it might open the door to it and soften their hearts to hear the true message! Breaking bread is about intimacy. Breaking bread is about sharing. Breaking bread is about presence. Breaking bread is about trust. Breaking bread is about hope. Jesus Feeds the Hungry, and so can you. The following was written by Pastor Kris Freeman as a servant leadership research thesis for Trevecca Nazarene University. In the hours before his trial, crucifixion and death, Jesus spoke these words to his disciples: “but among you, it will be different.” (Luke 22:26, The New Living Translation). The words of Jesus are true for any servant leader who pursues the calling placed upon a life by God. This calling signifies purpose, defines existence, and aligns lives with the will of God, the Heavenly Father. It was Jesus who knew more about his disciples than they of themselves, and explored their inner voice to be responsive to the coming of The Holy Spirit. For this reason, every leader must examine this “voice within,” — a vocare, a word of Latin root meaning “to summon (transitive verb) or calling (active noun)” (The Latin Dictionary). I am a servant of God, and have been called by Him for the direct purpose of servant leadership, to His kingdom and to the people I get the privilege to serve. I would like to take the opportunity to explain how the passage of Jesus’ words to his disciples has shaped the calling placed upon my life, and fulfill the “five practices of exemplary leadership” as outlined by this class at Trevecca Nazarene University, and Christian Reflections on The Leadership Challenge (Kouzes, Posner). To better understand how Jesus shaped his words to his disciples as servant leaders, it takes a greater context of the story. Two of the 12 were James and John, the sons of Zebedee and nicknamed by Jesus the “Sons of Thunder” (Mark 3:17, NLT). Both brothers came from a prominent family whose father had friendship and connection to the high priest. Their mother, Salome (All Women of the Bible), a devout follower of Jesus, asked him for a personal favor to give her sons a seat at his right hand when Jesus “came into his Kingdom.” (Mark 10:35-40, NLT). Jesus did not deny her request, but corrected her, and thus sets the table for the conversation recorded in chapter 22 of The Gospel of Saint Luke. But among you it will be different. Those who are the greatest among you should take the lowest rank, and the leader should be like a servant. Who is more important, the one who sits at the table or the one who serves? The one who sits at the table, of course. But not here! For I am among you as one who serves. You have stayed with me in my time of trial. And just as my Father has granted me a Kingdom, I now grant you the right to eat and drink at my table in my Kingdom. And you will sit on thrones, judging the 12 tribes of Israel (Luke 22:26-30, The New Living Translation). To this point, the disciples had been learners. As servant leaders, he was about to send them as ambassadors and define the role as apostles (MacArthur, 17). I am a leader, because I have been called as a servant. I am a servant, because I am submissive to the will of the Almighty God. I am submissive, because I realize that without God, I am nothing. And I am nothing, so I may serve my fellow man with humility and honor. It is this circle of servant leadership which defines my vocare and I hope to illustrate how God has shaped me as a learner and an ambassador to be his disciple and apostle. 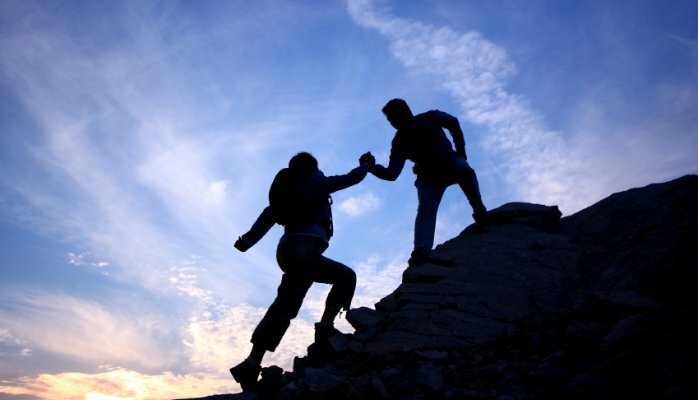 Kouzes and Posner further explain the role of a servant leader in five practices: leaders model the way, inspire a shared vision, challenge the process, enable others to act and encourage the heart (8-38). There are exemplary servant leaders in scripture who model these five practices. Joshua was commissioned by God as strong as courageous and modeled the way in the wilderness to eventually lead the Israelites into the Promised Land after the death of Moses. Nehemiah inspired a shared vision, asking the residents of the city to work on the rebuilding of the wall using the section in front of their own homes. Haggai challenged the process by encouraging the people of Israel to work on their hearts before working on their city stirring the spirit of the people. Elijah enabled others to act by passing the mantle of leadership to his apprentice, Elisha, and such did the Apostle Paul in the New Testament to Timothy. Andrew encouraged the heart by introducing many to Jesus including the first disciples and developed a reputation as one with a close connection with the Savior because of his people skills. Joshua modeled the way for leadership, but this came with humility and respect. At the death of his mentor, Moses, God responded to the prayer of Joshua. “Be strong and courageous, for I the Lord am with you wherever that you go” (Joshua 1:9, NLT). Outside of Jesus, it is my opinion Joshua is the greatest leader of the Bible. He was a military commander, a confident and trustworthy strategist and spy, and was fair and honorable as the leader of people in crossing into the land of Canaan and dividing up the land among the 12 tribes. “As a leader the first person I should lead is me” (Kouzes, Posner 42). Joshua realized to leave a legacy of influence as an exemplary servant leader, he must know himself and exemplify these practices. Therefore, Joshua’s modeling the way leaves an impact worth following. Nehemiah inspired a shared vision and rebuilt the wall around the city in 52 days. Kouzes and Posner further illustrate leaders envision the future and “passionately believe they can make a positive difference” (53). A servant in the court of the Persian king, Nehemiah requested leave to pray, plan and prepare a vision to rebuild the wall around the destroyed city of Jerusalem. This calculated process came full circle when the people followed the vision, stayed true to their work despite opposition, and celebrated its completion together. Through adversity, the people learned to trust a leader and work together. Nehemiah’s legacy as a builder inspires vision in others to stay the course and see God’s work to completion, and as a servant leader, he did not watch the process. He actively worked on the wall. Similar to Nehemiah, Haggai had a difficult job of speaking to a broken-hearted people looking to rebuild God’s temple after war-torn destruction. But Haggai challenged the process in leadership, reminding the people of a spiritual problem which needed correction before the physical problem was resolved. “So the Lord sparked the enthusiasm…of the whole remnant of God’s people. They began to work on the house of their God” (Haggai 1:14, NLT). If the enemy of growth is complacency, then Haggai challenged the comfortably of the people to get the job done. Exemplary leaders have courage, and this incremental change took what seemed like a small challenge and worked a big victory. Elijah enabled Elisha to act. One of only two Old Testament leaders to go the presence of God without death (Elijah and Enoch), Elijah was carried away by a chariot of fire. During the process, he was followed by his apprentice Elisha, who asked for a “double portion of his spirit” to fall upon him (2 Kings 2:9, NLT). This double portion was symbolized by a mantle worn around the neck of Elijah, signifying his leadership. The result was Elisha performed double the number of miracles recorded in the Bible to that of Elijah, minus one. After his death, a man was resurrected when his body was thrown into the tomb of Elisha and touched his bones, completing the miraculous double portion of miracles (2 Kings 13:21, NLT). Elijah was not the easiest leader to follow, but Elisha’s persistence matched Elijah’s challenge and he was enabled to act. Andrew is listed among the first four disciples, but was first a disciple of John the Baptist, the forerunner of Christ in the New Testament. The brother of Peter, Andrew takes prominence for encouraging others to act. He introduces Peter, James and John to Jesus as the fishermen dropped their nets and followed Christ. In John 12:20, he brings a group of Greek gentiles to Christ despite the hesitation of Philip. Most notable, it was Andrew who courageously brought a young man to Jesus in John 6:8, after the other disciples wished to send away thousands of hungry people. With encouragement and a servant heart, Andrew inspired the young man to donate five loaves and two fishes, and Jesus miraculously fed 5,000 men plus women and children. It appears by examination Andrew was a leader among the people, showed great humility, and loved to be a “right-catcher” (Kintner) and find those doing well and encourage an introduction to Jesus. The fact that Andrew is recognized less than Peter, James and John in the inner circle of the apostles says much about his ability to encourage and inspire others and take the emphasis off himself. An interesting case study might be the evaluation of the Myers-Briggs Type Indicator (MBTI) of the leaders in the Bible. While this instrument was not possessed in Biblical times to assess how each would handle and formulate leader opportunities, we have the ability to use their experiences and shape our own. The Myers-Briggs types parallel the gifts of the Holy Spirit as recognized in scripture. As a very clear E (extroversion), a moderate S (sensing), a clear T (thinking) and very clear J (judging), I find the shape of my Myers-Briggs profile lends itself to match my spiritual gifts. My top three spiritual gifts are teaching, shepherding and administration, which emphasize my leadership qualities of finding energy as an extrovert and completing tasks as a J. My shepherding heart is matched by a clear discernment of thought and spirit, and my decisions are made administratively as a thinker. The reliance upon discernment explains why I have balanced the role of a moderate S with a lean toward N (intuition) in how I process information. Thus, becoming a servant leader means before leading and influencing others, one must know themselves. While Biblical leaders never had the opportunity to identify as a Myers-Briggs type, each understood their vocare, even if that was developed by God through discipleship over time. This shapes me, and others, as we look to our heroes and examples in the Bible for further direction in developing leadership principles. While much of this writing has focused on Biblical characters, I also take inspiration in leadership from other people who have inspired my journey to a calling as a husband and a father, pastor of a church, a missionary to other countries, and an announcer and coach in local sports. Each of those roles contains a foundational parallel - using the voice given to me by God to inspire others with the vocare placed within my heart and soul, the voice within. The nine-year-old did, and O’Leary left the hospital with skin grafts on 87 percent of his body. He learned to write again using his disabled hands when Buck promised him an autographed baseball of a Cardinals player or legend, as long as John could write a thank-you note in return. The result was over 60 baseballs delivered to his home. Thirty years later, O’Leary is now a motivational speaker, author and was even mentioned by Buck in his baseball Hall of Fame induction speech. This year, O’Leary was brought into the Cardinals clubhouse to speak and inspire the team. Buck modeled the way, inspired a shared vision, challenged the process, enabled him to act and encouraged his heart and this left a legacy that is now being written by O’Leary — both for the safety of young people around flammable products, and to the disabled and challenged who need inspiration. This is the model for servant leadership. It is quite amazing that Buck’s humility allowed the story to be told 15 years after the announcer’s death from Parkinson’s Disease in 2002. A servant leader lives to inspire and influence this type of legacy. I have been shaped by the experiences of others, both Biblical heroes and modern servants, to construct the reflection of how God shapes my calling within me and how I see my own abilities to fulfill this calling. My giftedness and talent are ultimately for the betterment of others and the honor of God. A calling or vocare always involves service to others. May we all grow roots in leadership which are authentic and pure, knowing the fruit each one grows is never for the tree itself. The fruit is always for the one which needs nourishment, and therefore the disciplined working of the crop is worth every effort. When Jesus said it would be different among you, this is the type of apostle he was calling to go to the world. Holy Bible: New Living Translation (2013). Carol Stream, Ill, Tyndale House Publishers. Kouzes, J. M., & Posner, B. Z. (2004). Christian Reflections on The Leadership Challenge. San Francisco, CA: Jossey-Bass. Before the Passover Celebration, Jesus knew that his hour had come to leave this world and return to his Father. He had loved his disciples during his ministry on earth, and now he loved them to the very end. It was time for supper, and the devil had already prompted Judas, son of Simon Iscariot, to betray Jesus. (John 13:1-2). On Thursday night, there is a secret meeting in the upper room. Jesus is about to be betrayed, arrested, convicted and crucified and meets with his disciples one last time before this incredible event transpires. A discussion - who is the greatest among the disciples and will sit next to Jesus? Jesus knew that the Father had given him authority over everything and that he had come from God and would return to God. So he got up from the table, took off his robe, wrapped a towel around his waist, and poured water into a basin. Then he began to wash his disciples feet, drying them with the towel he had around him. (John 13:3-5). 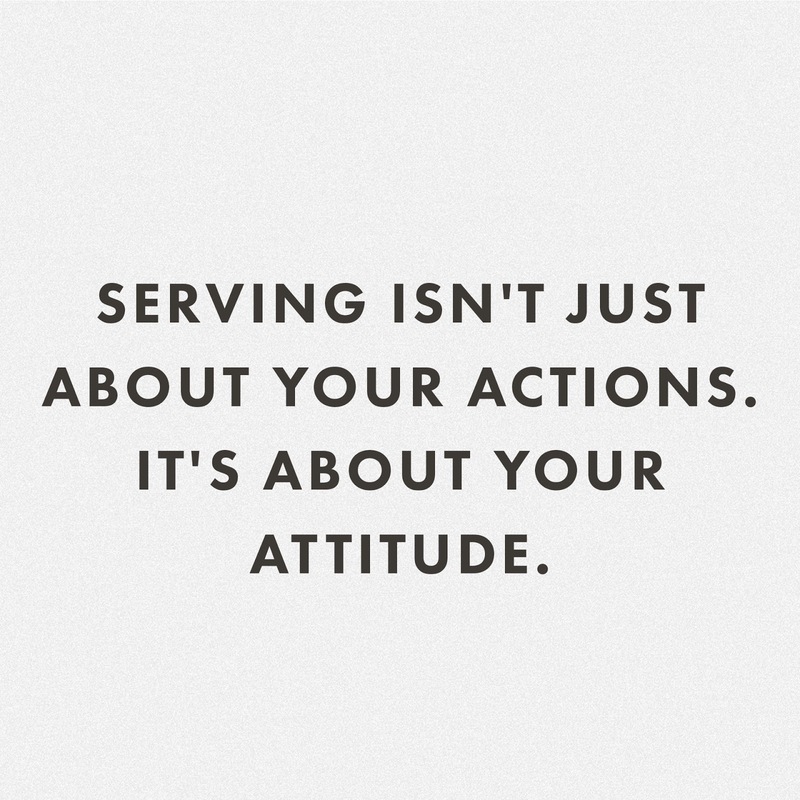 Serving starts with your ATTITUDE. He GOT UP - stopped what he was doing and put others ahead. Why wash the disciples feet? Common courtesy was to wash feet before entering the home/room. This should have already been done. What are the common courtesies of your hospitality? - Take coat, offer place to sit, food or drink, adjust the temperature, place to stay. NONE of these seem like a low and humiliating task! A normal host would have CALLED for a SERVANT instead of doing it themselves. The act of washing feet was setting an example of HUMBLE service to proud hearts with selfish desires. He is not either-or, he is BOTH-AND. He set the example: leaders serve and servants lead. 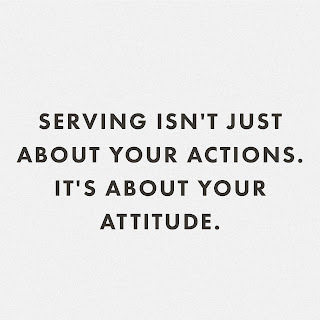 Quote this: Serving is not always about my actions. Serving starts with my attitude. Washing their feet was showing them how much he LOVED them and was willing to humbly serve them, so they by example would serve the world. Quote this: When you serve with the right heart, it’s not about you. Your gifts are not about you. Your talent is not about you. Your serving is not about you. Serving doesn’t need to be seen (but it CAN be), serving doesn’t need to be acknowledged (but it MIGHT be), serving doesn't need to be repaid (but it COULD be). “But I can’t find a church that meets my needs.” WHAT??? Why? Every Christian has a calling. You are not called to be a Christian CONSUMER, you are called to be a Christian CONTRIBUTOR. Want to change your marriage? Serve. Want to change your friendships? Serve. Want to find meaning in life? Serve. Want to make a difference in the world? Serve. Want to glorify Jesus? Serve. 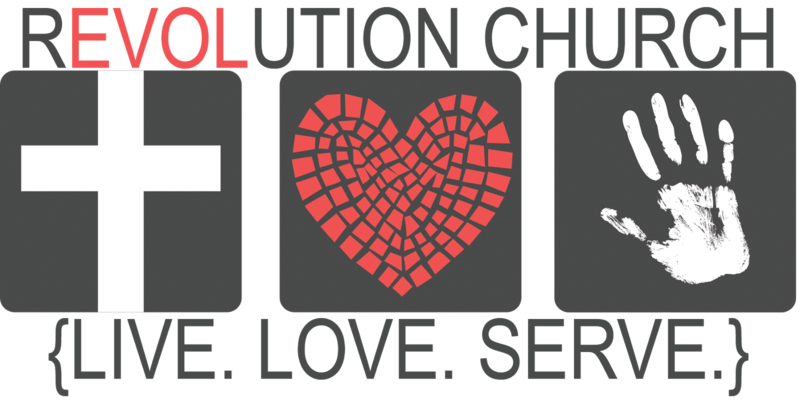 Want to make your church a better place for others to meet Jesus? Serve. Want to change your community? Serve. 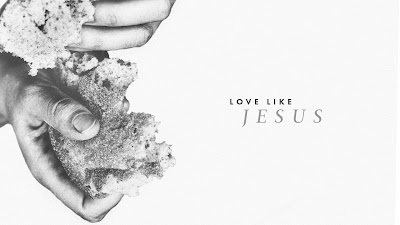 If you want to love like Jesus, serve like Him.